Forest Hills, Queens, August 11, 2006 - Well, if I'm going to be injured, I may as well make the best of it. The cane is useful for support, for garnering sympathy, for my dance routine (when I get better), and, if I also had a lawn, for shaking at the neighborhood kids when they're on said lawn. 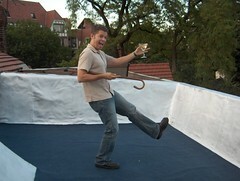 Instead of a lawn, we have some nice roof space, which we finally refinished after only five years of living here. The original idea was to then put up a pretty wooden deck, but it was much much cheaper (and faster) to buy some outdoor carpet and lay it down myself. Which I did on a nice nearly-100-degree day (Sunday, July 30), after I had hurt my foot, but before I fully realized it was broken. Not the most ideal of conditions, I must say.